It feels like almost every other day that the world’s beauty brands are signing up new spokesmodels, with many a savvy decision being made. Estée Lauder is a brand up there in the top five when it comes to most killer stables, and the beauty mega brand announced yesterday that stellar up and comer Anok Yai is their newest face. One of the fashion world’s newest and brightest stars, Anok will feature in makeup and skincare campaigns across digital, TV, in-store and print. Anok’s first campaign will be for the brand’s number one foundation, Double Wear Stay-in-Place Makeup, debuting August. She joins the current roster of Lauder spokesmodels, which includes Misty Copeland, Grace Elizabeth, Kendall Jenner, Karlie Kloss, Yang Mi, Carolyn Murphy, Hilary Rhoda, Joan Smalls and Fei Fei Sun. 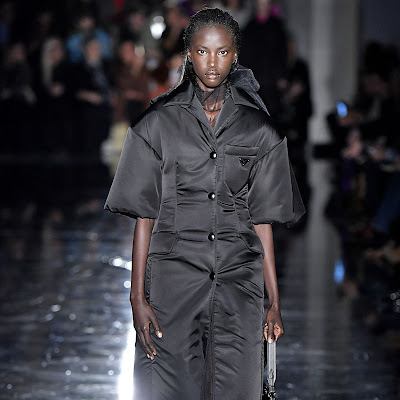 For those that don’t know her – and that glorious face – Anok was responsible for a history-marking moment when she was the first black model to open the Prada runway show (see below) in 20 years (Naomi Campbell was the first, back in 1997). Discovered after Instagram images of her at college homecoming celebrations in Washington, DC went viral, Anok became hot property whilst still at school after she was contacted by several top modelling agencies. The Egyptian born beauty eventually found home at NEXT Model Management, where she is signed globally. Just one week later, she confirmed the leading role in Prada’s Spring/Summer 2018 campaign photographed by Willy Vanderperre and shortly afterwards became the face of the Riccardo Tisci x Nike collaboration. Anok appears on the cover of DAZED’s Summer 2018 issue and has also been photographed for American Vogue, V Magazine, Vogue Italia, British Vogue, POP Magazine, AnOther Magazine and Self Service to name just a few. The daughter of Sudanese refugee parents, Anok moved to the United States in 2000. She has plans to become a doctor and empower young girls to pursue STEM fields.